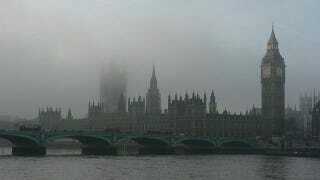 No one likes smog, but until 1952, Londoners had considered it just part of living in the city. If anything, newer forms of heating had improved the air quality in the city. In Victorian times, when nearly everyone had a coal fire going, pollution got very bad. In November and December of 1952, much of the city did have fires going, since it has been even colder than usual. On the evening of December 5th, above London, though, an anticyclone was brewing. An anticyclone is a high-pressure area that keeps other air from flowing in. It allowed a warmish cap of air to settle over London. When the air is cold, hot chimney smoke rises quickly until it cools and disperses in the upper atmosphere. An atmosphere of hot air keeps the chimney smoke from rising and escaping. So while the anticyclone kept new air from coming in, the warm air on the ground kept the smoke from leaving. It was all trapped over a city that was still burning more fuel. The resulting blob seemed, to some people, to gain a kind of sentience. Visibility on December 5th fell to a few yards. By December 7th, it was one foot. The sulfur dioxide and other pollutants mixed with water particles to form sulfuric and hydrochloric acid that burned people’s eyes and lungs. It made it impossible for cars to move, and so they were abandoned on the roads. By December 6th, five hundred people had died, and the ambulances had stopped going out. There were too many abandoned cars on the road, and the visibility was so poor that rescue workers had to walk ahead of their vehicles to get anywhere, anyway. Thousands of people walked to hospitals, arriving gasping for breath, their lips turned blue due to asphyxiation. There were human dangers, too. Since police forces were practically incapacitated and people walking down the street couldn’t see more than a foot in front of them, robbers attacked and robbed people, or broke into houses with impunity. Even sealed and cleared spaces were infiltrated. Library workers reported walking through the stacks of libraries and turning a corner, only to find themselves in the middle of a solid swirl of the fog. On December ninth, when nine hundred people died, a wind suddenly kicked up, and the fog dissipated. The government, which had ignored environmental protests in the 1920s and supported industries that put up smoke stacks which spewed out sulfur dioxide, maintained that most of the people killed during the fog had died of the flu. When that didn’t work, they set down strict guidelines as to what could be counted as a smog-related fatality. This pared the list of deaths down to four thousand, but ignored many deaths of already-sick people who would have lived if they had been able to breathe, and discounted those people whose lungs were destroyed and who were still dying of asphyxiation in hospitals after the smog had lifted. Still, the attitude toward smoke stacks in cities changed, and over the next few years, environmental regulations went through - although the summer of 2012 saw a record amount of smog in London. It is estimated that twelve thousand people died directly due to the smog - a little more than a third of the number that died during the Blitz - and many more probably died early due to the four days of poison gas that they had to live through. Via Catastrophe Map, Met Office, The BBC, and NPR.